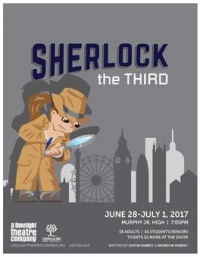 Sherlock the Third is an American play written by Brandon & Justin Mabrey, directed by Anthony Ortiz & Ginger Simons, performed by The Limelight Theatre Company at Murphy Junior High School (Plainfield, Illinois, USA) from 28 june to 1 july 2017, starring Jason Olaszek and Zachary Hotchkiss as Arthur Holmes (grandson of Sherlock Holmes) and Addison Parks and Rebecca Anderson as Elizabeth Watson (granddaughter of Dr. Watson). As the German Luftwaffe pelt the city of London with bombs during the height of World War II, the grandson of master detective Sherlock Holmes teams up with Watson's granddaughter to get to the bottom of a mysterious act of international espionage. As the plot thickens, the amateur sleuths may need to turn to their famous grandfathers for help in solving the case. All actors are aged 8-13.